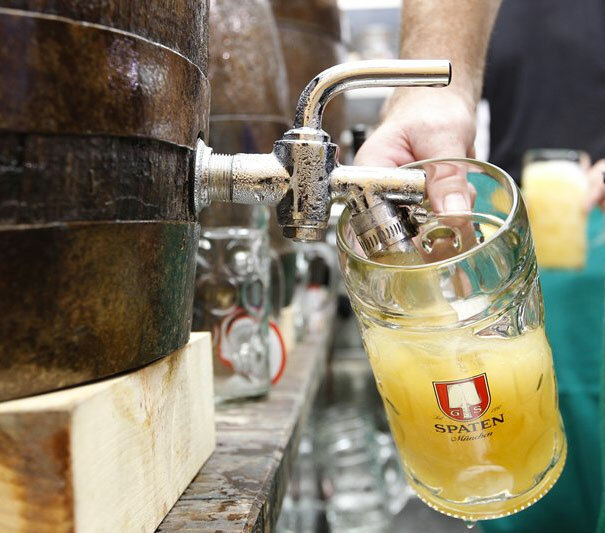 Sunday, October 7 marks the end of Oktoberfest, Munich’s 16-day party celebrating all things München beer. This weekend, we’re shifting to beer in a show of solidarity with the fatherland. Dating back to 1810, Oktoberfest is the world’s largest fair, with more than 6 million beer fans making the pilgrimage to Munich’s Theresienwiese (Theresa’s meadow, the grounds named for princess Therese of Saxe-Hildurghausen who married crowned prince Ludwig in 1810, inciting the first Oktoberfest festivities), the site of all the big-tented biergartens. The Bavarian jubilee exclusively features beers brewed within Munich’s city limits, showcasing six standup breweries, some with histories stretching so far back, they eclipse the founding of the U.S. The beers at the festival are a bit stronger than most lagers, with an ABV around 6%, so some can be a bit heavy, but each is distinct and delightful. So this weekend, we’re taking a look at the six Munich breweries that make Oktoberfest the world’s biggest beer party. 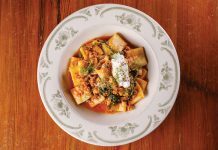 Most are readily available, though two are a little tricky to find stateside. Established in 1634 when the order of Pauline monks began brewing beer in the Au (monks considered beer liquid food, and since “liquid doesn’t break the fast,” beer was part of their daily food allowance, particularly during Lent), Paulaner has a rather robust heritage under the belt, and was one of the original breweries to celebrate the wedding of Ludwig and Therese in 1810. 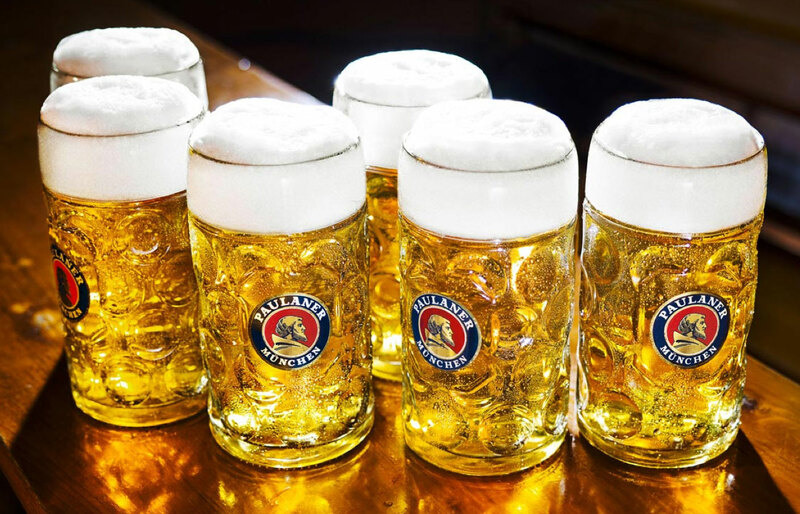 Established a staggering 615 years ago (that’s 1397 CE for those keeping track at home), Spaten-München has been a standard-bearer of Bavarian beer tradition well before Columbus ever sailed the ocean blue. As one of the oldest breweries in Munich, Sapten’s timeline fluctuates, going from the smallest Munich brewery in 1807 to the largest in 1867, the first Munich brewery to brew a light lager in 1895, to merging with Löwenbräu in 1997. In all, Spaten has had a good, long time to tinker with its brewing process and recipes, perfecting the art of the lager. Spaten’s Oktoberfest offering is all about balance. As a märzen, the beer pours a golden/amber with a billowing off-white head. The roasted malts border on caramel while the hops add balance with a slight bitterness. It finishes crisp and clean with a bittersweet aftertaste. Spaten has been around for a while, which shows through in the beer—one of the best Oktoberfest brews around. 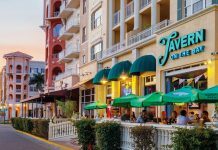 Founded in 1417, the Hacker Brewery was a solo affair for nearly 400 years until Hacker heiress, Therese Hacker, married a farmer’s son Josef Pschorr in 1793 (talk about marrying up). Pschorr took over the brewery from his father-in-law, spurring a renaissance within the brewery, making it one of the most popular brews of the time. in 1820, Pschorr purchased a rival brewery, creating the Pschorr Brewery. The man on the label, Georg Pschorr, Josef’s son, inherited the breweries, undertaking expansion projects, bringing the breweries into the modern era. Hacker and Pschorr merged to form one brewery in 1972, becoming Hacker-Pschorr. Now part of the Paulaner Brewery stable, Hacker-Pschorr is most well known for its wheat beer, but its Oktoberfest Märzen is a choice brew in its own right. Hacker-Pschorr’s Oktoberfest offering is another märzen-style lager but pours a deeper amber/copper color with a nice pillow off-white head. Roasted malts give a nutty, caramel flavor, with a spicy finish on the hops. Velvety and smooth, this is a well-balanced beer from a München original. The renaissance era brewery, Hofbräu-München, comes to the table with some royal accolades. 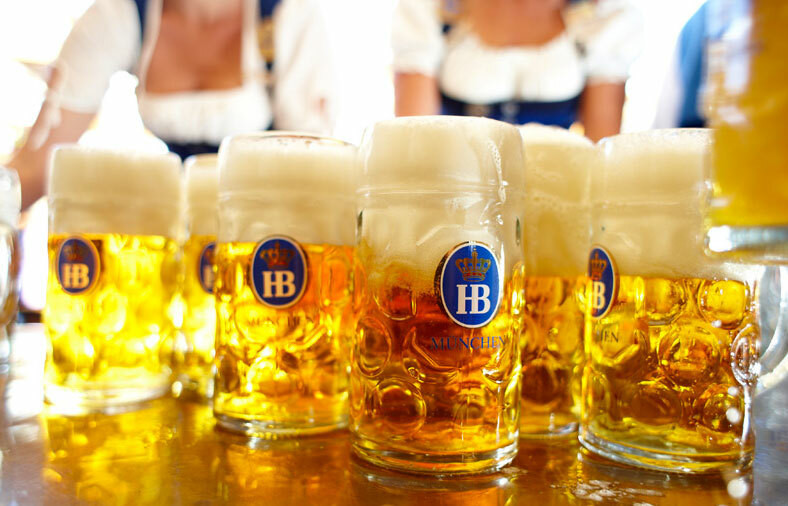 Dissatisfied with the beer of Munich in his day, Wilhelm V, Duke of Bavaria, founded his own brewery, Hofbräuhaus in 1589, the “Ducal Brewery.” In 1607, Wilhelm’s son, Maximillian, then Duke of Bavaria, opened a second brewery and beer hall, Hofbräuhaus am Platzl (plaza), just for weissebier (wheat beer, breaking from Bavarian Purity Law of 1516), and in 1610, took the beer public, allowing for the sale of beer through taverns. The plaza Hofbräuhaus still stands today and is one of the most recognized brew houses in the world. Though Hofbräu München’s weissebier is one of its most well-known international brews, their Oktoberfestbier is one of Munich’s standouts. Pouring a bright, clear golden hue, the crown on the brewery’s logo translates through with a thick mountain of white head. Hofbräu’s Oktoberfest selection has the same caramel roasted malt flavor as the others, but there is a distinct citrus and spicy undertone from the noble hops, quite unique and refreshing. Löwenbräu’s roots spread deep. Though historical record is not as clear as one would hope, the brewery puts it’s founding at 1383, a simple inn with an attached brewery, making it one of Munich’s oldest breweries. From these humble beginning, Löwenbräu became a force to reckon with in the Munich beer market, an ultramodern and efficient brewery, producing a quarter of all beer brewed in 1865. A stalwart of Reinheitsgebot (Bavarian Purity Law of 1516), Löwenbräu has a stable of lagers, though there is a wheat beer for good measure. 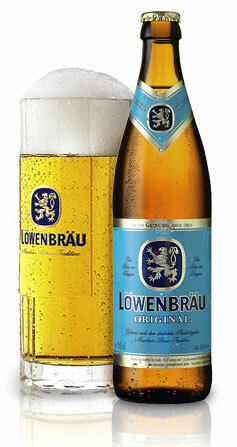 Merging with Spaten in 1997, Löwenbräu has steadily grown its international appeal. By far the most difficult beer to get your hands on stateside, Löwenbräu’s Oktoberfestbier märzen is a rarity on these shores, even though it is now a subsidiary of Anheuser-Busch InBev. But Löwenbräu Original, with its light blue label and golden lion logo, is a bit more accessible and a good substitute in a pinch. A Helles Lager, Löwenbräu Original, 5.2% ABV, pours a straw/yellow color with a bright white head that dissipates quickly. Slightly effervescent, the beer comes off crisp, with some hoppy spice and a sweet end. Augustiner Bräu is Munich’s oldest brewery, established in 1328, and still maintains its independent, privately-owned status, resisting super conglomerates like Anheuser-Busch InBev. Like most breweries with six centuries of tradition, things started with monks—they really loved their beer. Now, with 684 years of brewing experience under their belt, Augustiner is Munich’s most popular brewer, even without an advertising department, maintaining one of the city’s largest biergartens, Augustiner Keller, and a tent at Oktoberfest. 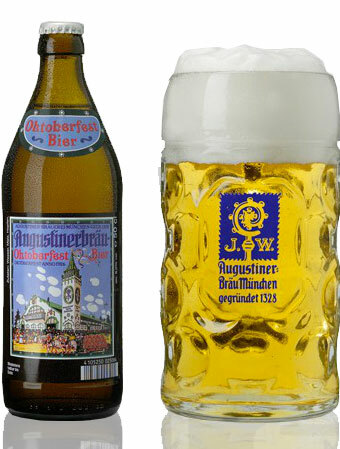 Unfortunately, Augustiner’s Oktoberfestbier is produced solely for the Munich festivities; so if you’re looking for a liter, get your passport ready. If you would like to nominate a cocktail recipe to appear in our latest series “Weekend Cocktails,” email the online editor here. Become a master mixologist, or at least look like one, with the tools that make the trade. Muddler: This little tenderizing stick is a godsend and a must for any home bar. If fruity cocktails are in your future, the muddler is the only way to unlock fruits’ flavor. Handheld Citrus Juicer: Nothing beats freshly squeezed juice, but it can be a pain. Invest in a handheld citrus juicer; they are cheap and do the trick tout de suite. Cocktail Shaker: Don’t be a chump stirring your martini like a noob; purchase a nice shaker and become a master home barkeep. Jigger: This little apparati will make mixing the perfect drink as easy as pie. It’s equipped with 1½ oz. and ¾ oz. cups for perfectly measured pours every time.